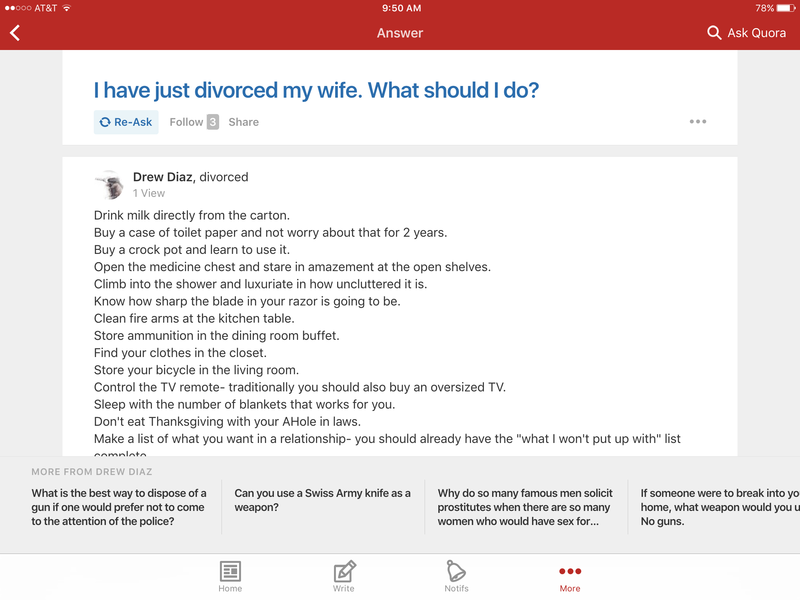 I just divorced my wife. What should I do? Drink milk directly from the carton. Buy a case of toilet paper and not worry about that for 2 years. Buy a crock pot and learn to use it. Open the medicine chest and stare in amazement at the open shelves. Climb into the shower and luxuriate in how uncluttered it is. Know how sharp the blade in your razor is going to be. Clean fire arms at the kitchen table. Store ammunition in the dining room buffet. Find your clothes in the closet. Store your bicycle in the living room. Control the TV remote- traditionally you should also buy an oversized TV. Sleep with the number of blankets that works for you. Don’t eat Thanksgiving with your AHole in-laws. Make a list of what you want in a relationship- you should already have the “what I won’t put up with” list complete. Look forward to when you are not doing about 1/2 of the items above- because you’re living with someone again.